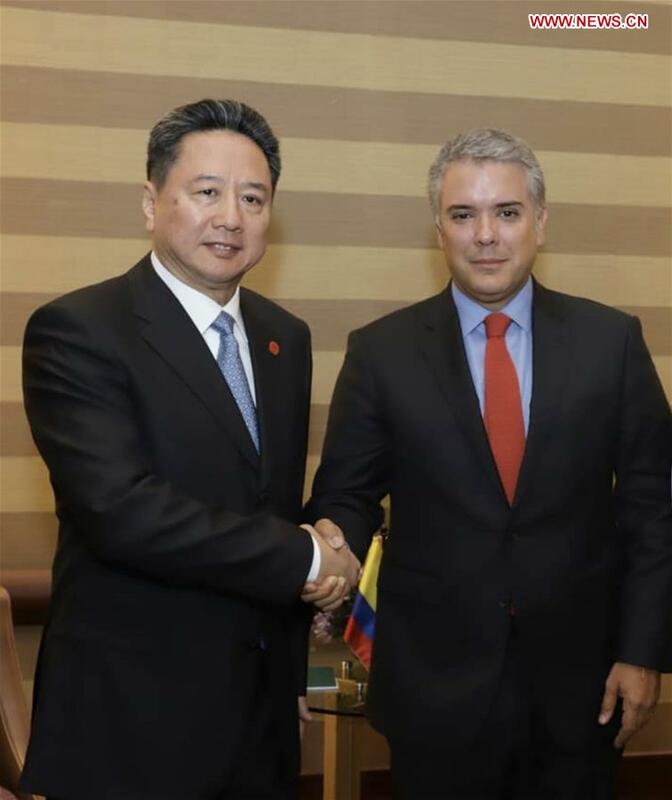 BOGOTA, Aug. 8 (Xinhua) -- Chinese President Xi Jinping's special envoy Li Xiaopeng, also the transport minister, attended the Colombian presidential inauguration and met with the new president, Ivan Duque, here on Tuesday. Li conveyed Xi's warm congratulations and good wishes to Duque, and said that China and Colombia are facing an unprecedented historical opportunity to strengthen cooperation. China is ready to join efforts with Colombia to prioritize political guidance, tap bilateral cooperation potential, boost cooperation within the framework of the Belt and Road Initiative in such areas as trade and economy, energy and mining, infrastructure construction, agriculture and innovation, promote exchanges and mutual learning on civilization and step up coordination on multilateral affairs, so as to keep pushing China-Colombia relations to new levels, Li said. Duque thanked Xi for sending an envoy to the inauguration. Colombia has attached great importance to its relations with China and treated the development of the bilateral ties as a priority of its foreign policy, Duque said, adding that his country is willing to strengthen exchanges with China on governance, deepen cooperation in various areas, and push for the sustained development of bilateral relations.